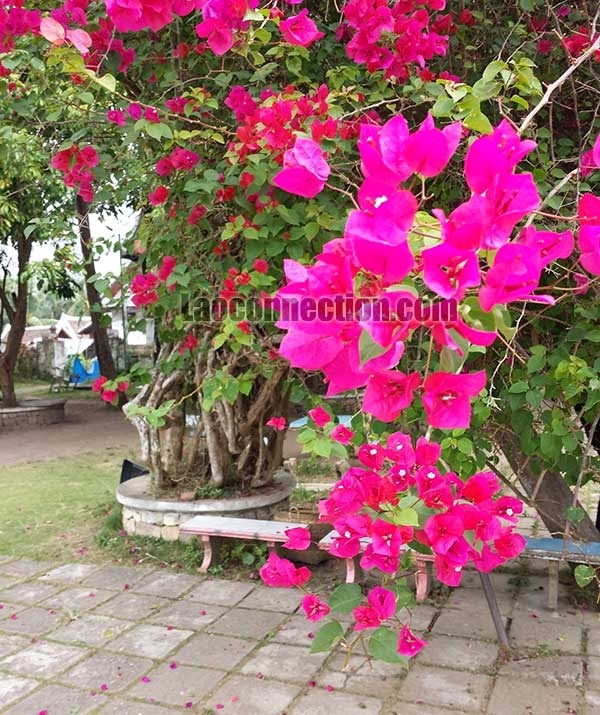 Laoconnection.com: Almost Forgot to Visit Vat Xieng Tong Museum! 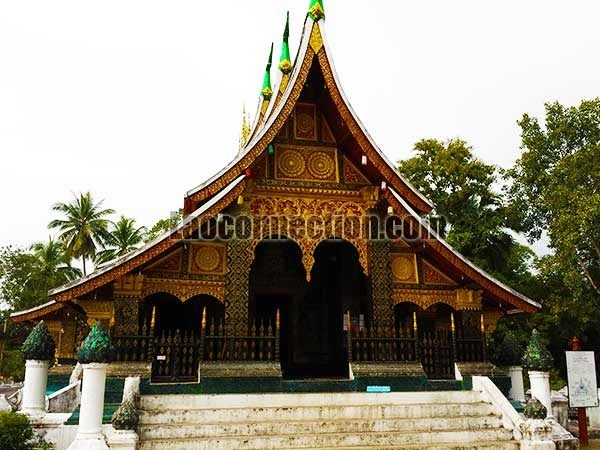 On one of the free days I had in Luangprabang (December 4 2013) with no plans, I decided to go strolling around all down the main street heading in the direction away from downtown and primarily taking pictures of the temples as I went along. The further I got away from downtown the more it felt I was entering the suburbs. But I didn't care as I was enjoying the sites. 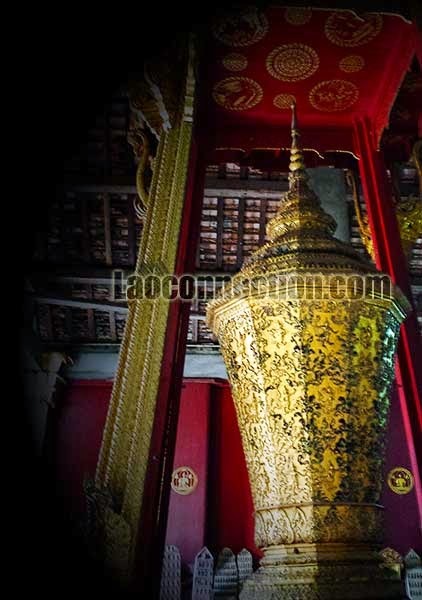 Vat Xieng Tong has historical significance in that it was under royal patronage. 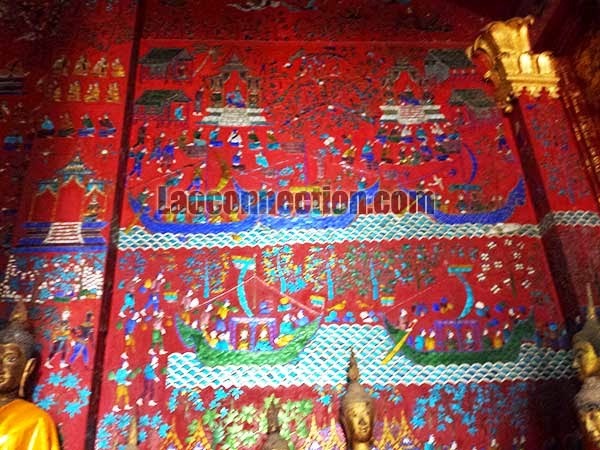 As such, the artwork at the temple is incredibly detailed and beautiful and many of the ceremonial items used in the royal procession were from there as well. While I appreciate the significance and was happy to see the site, I don't doubt that there are those out there who would say it was just another Buddhist temple. I arrived around early morning and there were other people but not a lot (at least not yet). On the path leading up to the main entrance of the temple museum there was a young girl selling the usual touristy wares and knick knacks. 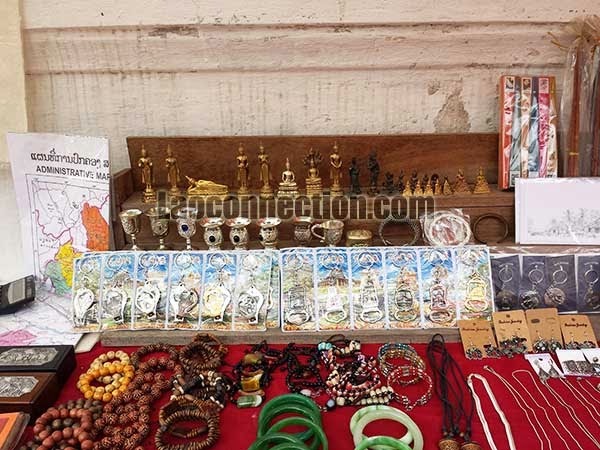 I ended up buying a couple of things from her including a Lao language country map which I had wanted. After buying that from her, I made my way to the entrance and paid the entrance fee of 20,000 kip. 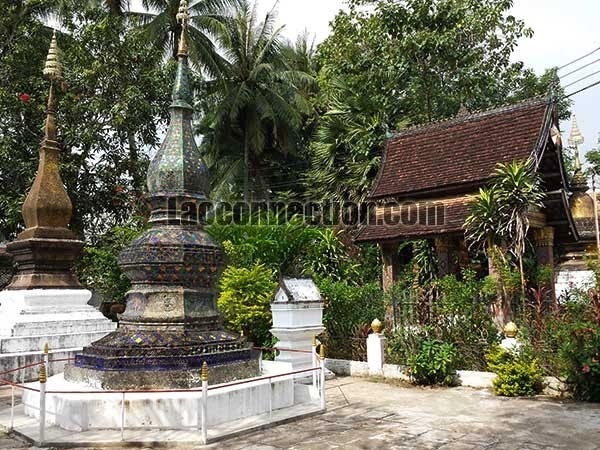 As you view the wide temple grounds there are several buildings. The first place of interest as you walk in from the main entrance is the storage building on the right hand side. I say storage building but truthfully it looks like a temple from the outside. From the outside it is a beautiful eye catching building in its own right. 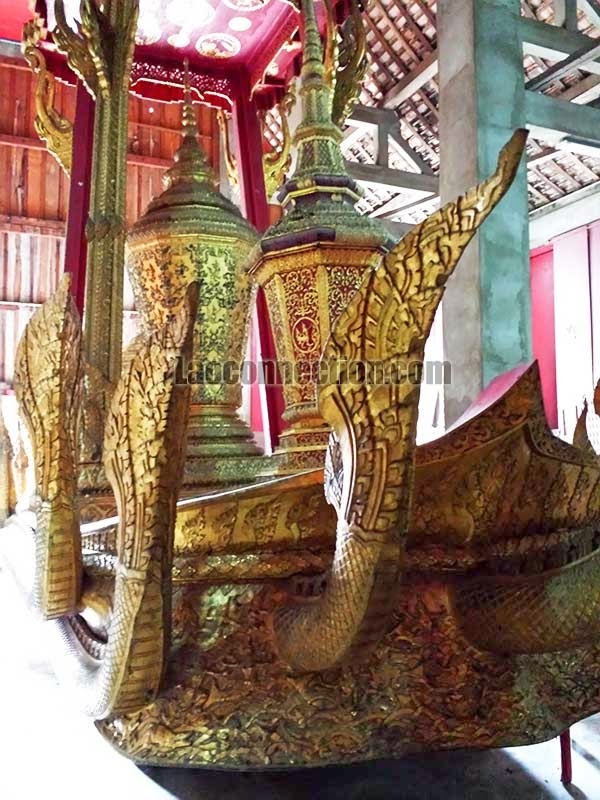 Upon entering it, you're met with seeing the large historical pieces such as the urn, carriage and naga that were used by the temple and former Lao royalty during special occasions. 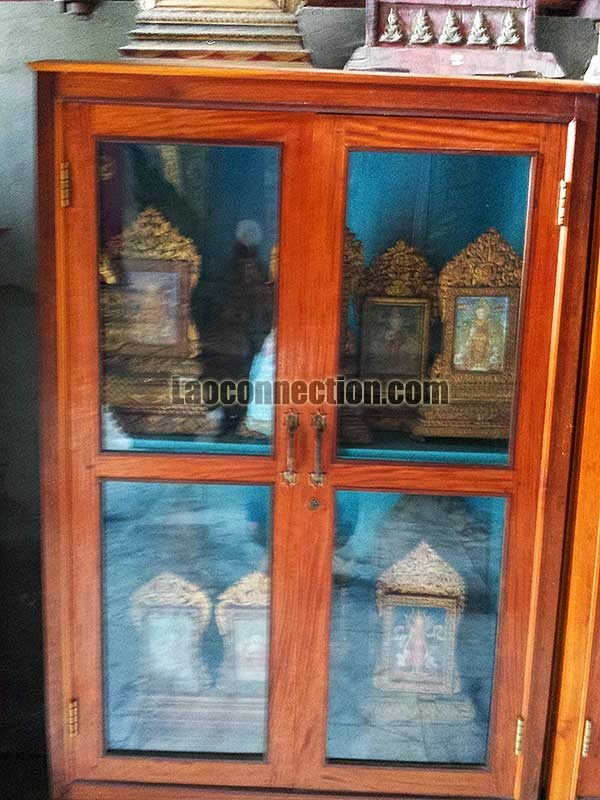 On the right and left hand side of the room are display cabinets with items on top of them. Inside the cabinets themselves they're filled with what are likely decades, if not centuries old, items like statues, amulets, carved wooden frames, and other things used during that period. 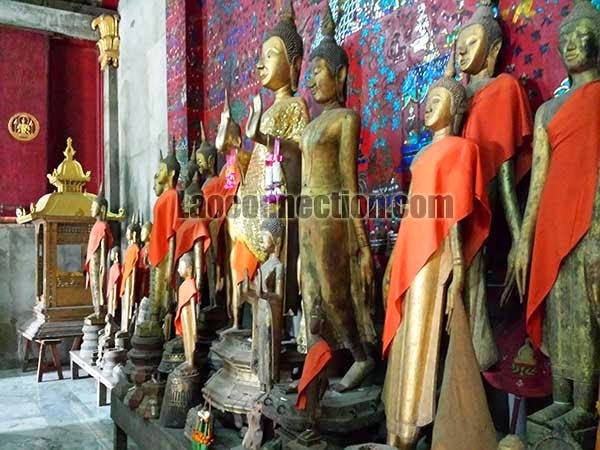 At the back of the room there are several tall standing golden Buddhas robed with saffron cloth. What is also quite striking and most notable about the building itself are the glass mosaics on the walls and ceiling that depict people and environments. Clearly the mosaics told a story however at the time I didn't what story. I didn't find out the answer until after I bought a book (yes, another book to the rescue!) 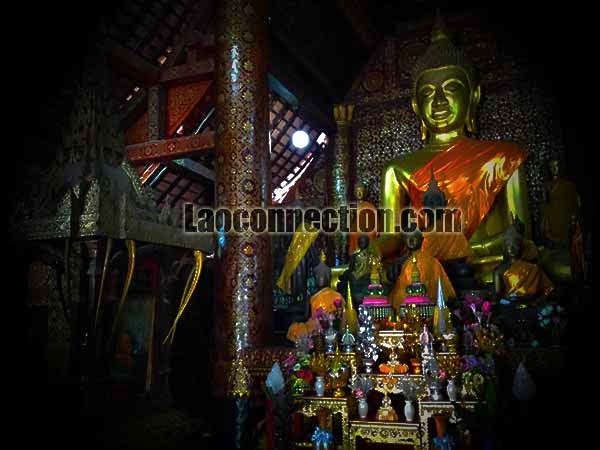 from Big Brother Mouse called Wat Xieng Thong: The Stories of Siaosawat (​ນິ​ທານ​ຊາ​ດົກ ​ເລື່ອງ ​ທ້າອ​ສຽວ​ສະ​ຫວາດ) retold by Somphong Sakvy (​ສົມ​ພົງ​ສັກ​ວີ) and published in 2009. It's written entirely in Lao and really the only companion book that I've found that explains the mosaics in detail. They really should be selling copies of this book right at the museum. And ideally it should be translated into English for tourists. Reflecting on how mosaics covered the walls, I couldn't help but marvel at the time it must have taken the artists to bring the stories together from all these pieces of small glass to make the stunning artwork. As I came out from that "storage building" I took some more pictures of the temple grounds and of a big tree with beautiful purple blooms. As I continued taking pictures, it was then I noticed groups of tourists had arrived. I heard some of them speaking Spanish. Along with other tourists already there, it made for an interesting group of people. I sometimes forget how internationally well known Laos is now. Not like what it used to be when people would respond with "What? 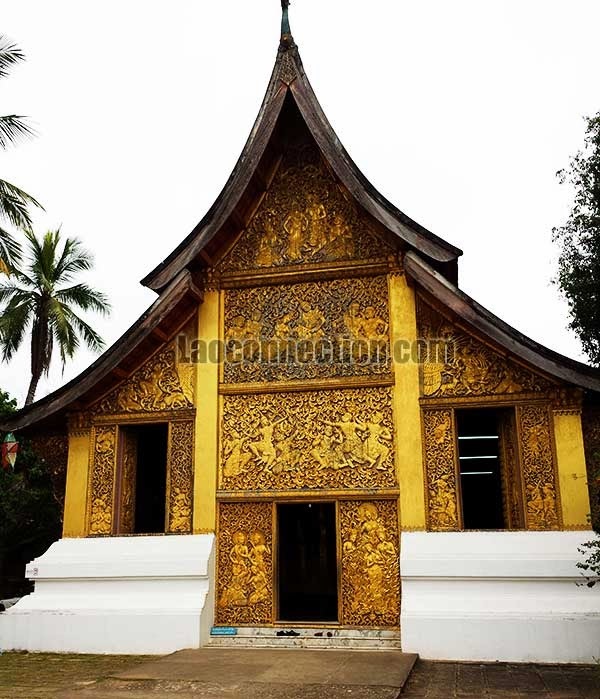 Laos? Where's that?" if the name of the country was ever mentioned in conversation. I made my way to the primary building, the main temple. From the outside, it's quite nice with its facade and low swept roof. 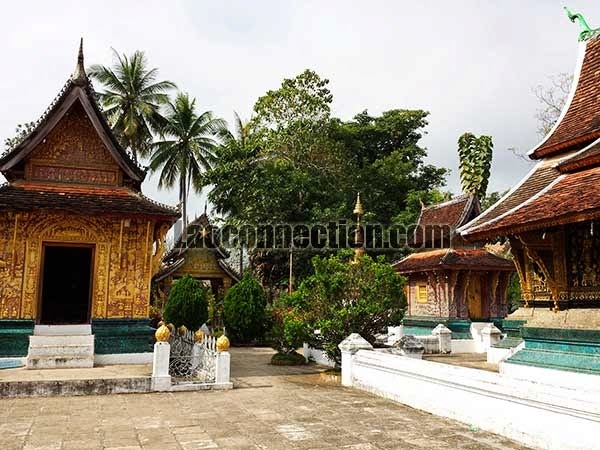 It was very much the iconic image I'd seen time and time again in travel books and websites about Luangprabang. I took my shoes off and made my up the stairs to the front. There was already a young couple in there taking pictures. It was interesting how calm and quiet it felt inside the temple in spite of the fact that there were tourists outside. Admittedly, the inside is not that spacious and feels quite dark with low ceilings. It's all very well kept but you definitely get the feel that it is very much an aged place. 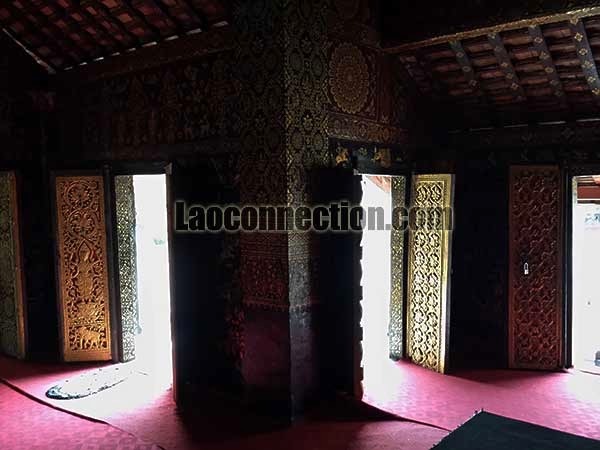 For example, inside there's old carved wooden objects used during certain ceremonies, also lots of different Buddha statues, and also structural pillars, windows and doors are all made of carved wood. 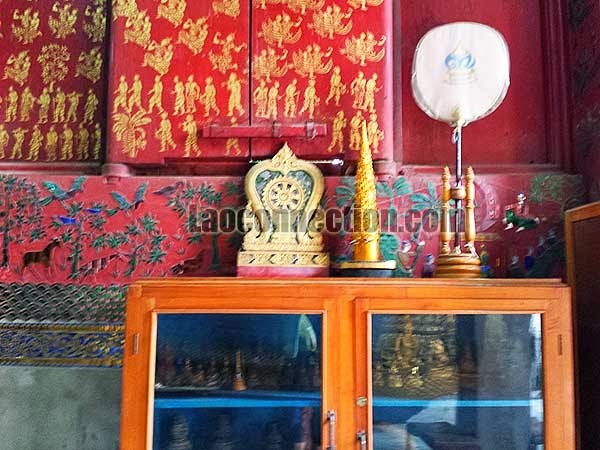 Aside from the Buddha statues, all the additional things in there made it seem as though it too had become a repository or storage space. I was taking pictures and at one point turned my head towards the 2 entrances (one in the front where I had came through and one off to the side) and as it was a bright sunny day, the light shined right in. In fact I think most of the lighting came from having those open doors. It made it look all the more surreal - dark interior environment with old wooden pillars and doors with sunlight shining through. I remember taking a moment to appreciate the serene and simple beauty of that as I stood there now by myself since the other tourists had left by that point. I left the main temple through the side door. 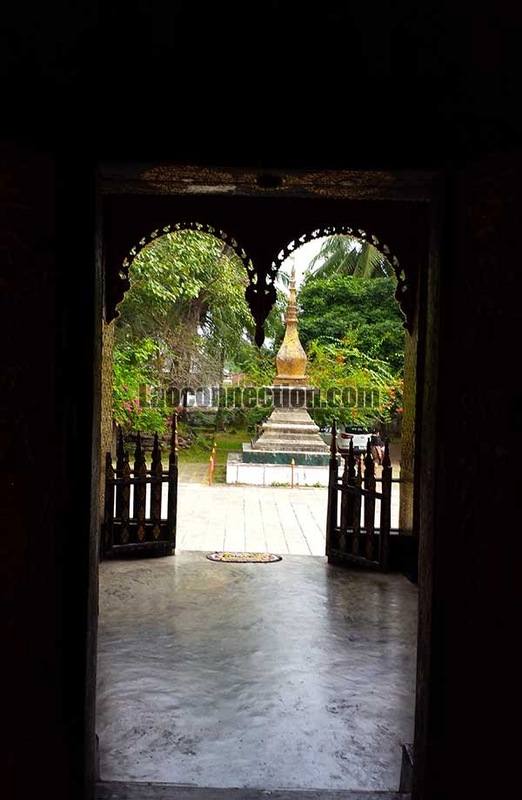 At that point there's a small altar with stairs and if you continue in that direction you'll see a couple of very tall stupas, dormitories and what not. Continuing in that direction brings you to the side exit of the temple grounds (not the primary entrance of where I had entered). 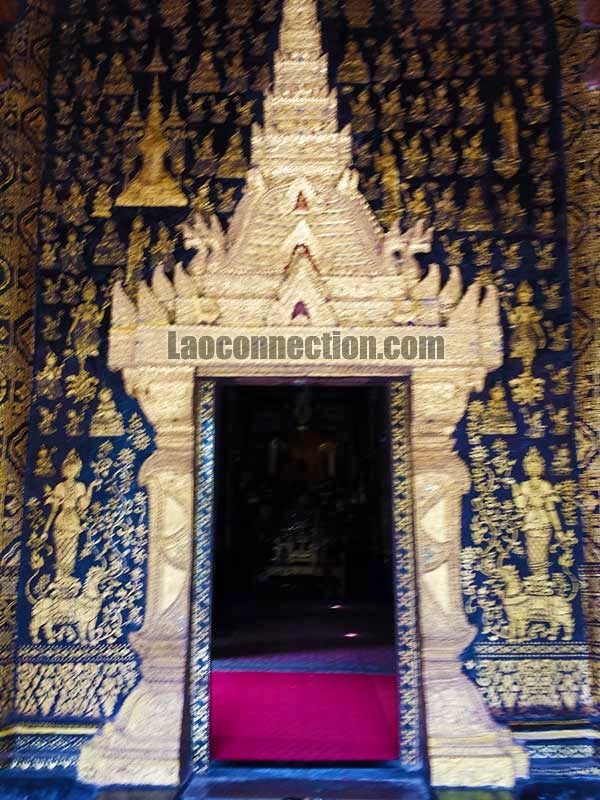 After taking a few pictures of the large stupas, I left the temple grounds through this side exit. By this point it was afternoon and there was the full strength of the sun. 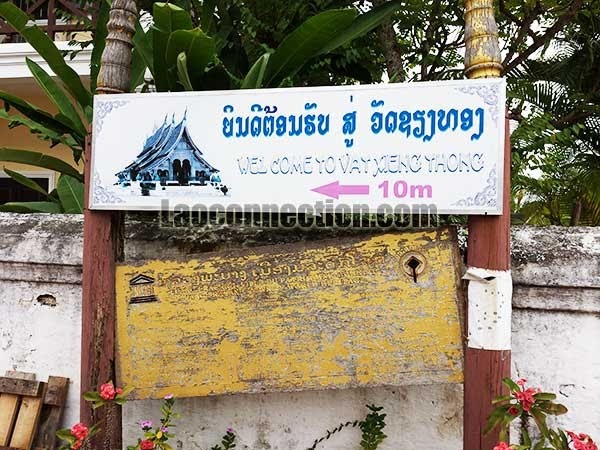 And I was hungry so it was on to go look for a place to geen kow (to eat) so I made my way back to downtown Luangprabang feeling quite satisfied with my visit of Vat Xieng Tong, a place I almost forgot to visit.